After more than a decade of struggling for consumer acceptance on desktop and notebook PCs, Linux appears to have found a solid niche for itself on ultrasmall notebook PCs such as Intel Netbooks and Mobile Internet Devices (MIDs). This week at OSCON, the annual open-source conference in Portland, Oregon, Canonical is showing off a new version of its Ubuntu Linux operating system that's designed specifically for Intel Atom-based Netbook PCs. 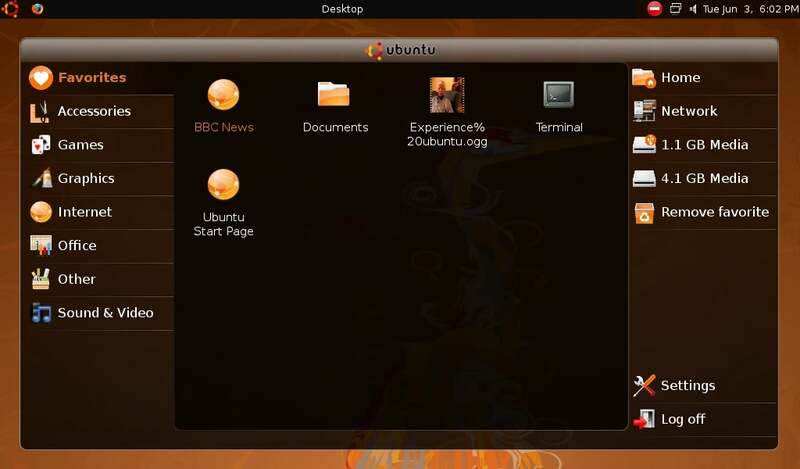 The Ubuntu Mobile Edition interface layer in Netbook Remix is designed to make navigation faster on tiny devices. Ubuntu Netbook Remix, which is actually a full distribution of Ubuntu Linux with a few packages of interface mods running on top of it, streamlines the OS's user interface to make it easier to navigate on tiny PCs with itty-bitty screens. Known as the Ubuntu Mobile Edition (UME) Launcher, this streamlined interface automatically resizes and reformats application windows to conserve screen real estate by moving tabs and other app controls in the title bar. It also presents a simple menu system for choosing apps by category, not unlike the default Xandros interface found on Asus Eee PCs. Netbook Remix represents a strategic step forward for Canonical: The company has designed it primarily as a mainstream OS that will ship preinstalled on retail PCs. Building on the success of the company's relationship with Dell, which sells several models preinstalled with Ubuntu, Canonical is working with Netbook manufacturers to offer the new OS as a standard configuration option competing directly with Windows XP on store shelves. At press time, Canonical representatives would not comment on which hardware makers the company is working with, but they did say that Netbook Remix is expected to appear on retail devices by the end of 2008. Also forthcoming from Canonical is another diminutive Linux distribution aimed at Mobile Internet Devices, a category of products smaller than Netbooks. Ubuntu MID Edition will ship exclusively as an embedded operating system on small, touch-screen mobile Internet handsets. Its customizable interface is even more compact than the UME menu system on Ubuntu Netbook Remix, and includes a more select sampling of Linux applications for communications, productivity, and GPS navigation. MID Edition also includes support for Web 2.0 content from Facebook, YouTube, and other sites, as well as some 3D game support. Canonical expects Ubuntu MID-based devices to ship by year-end as well. Click here for the latest Linux and open-source news.